Is an association of Italian companies specialised in the distribution of fasteners. The purpose of the Association is to regulate and standardise the relations among fastener distributors and between these and national and international manufacturers. The association is made up of natural persons, sole proprietorships, and commercial companies whose main activity and specialisation is the distribution of fasteners (nuts and bolts and similar items). UDIB aims at promoting relations among the members and provide technical and regulatory support, thereby solving the problems encountered by the companies of this sector in a unified manner. 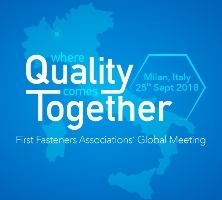 on September 25th 2018 at the Hotel Cosmo Palace in Cinisello Balsamo (MI), the first Fasteners' Association Global Meeting was held, entirely realized by UDIB. The meeting was attended by 8 Presidents of as many trade associations. About 150 people from 13 countries participated in the meeting and delegations from Taiwan, Hong Kong, United States and Turkey were present, as well as delegates from other European and world associations. During the second part of the meeting, Ing. 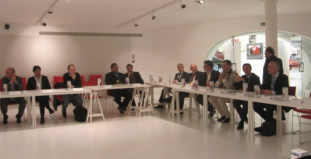 Sante Costa, a reference figure in the world of fasteners quality, has held a very interesting conference with the title: QUALITY IN THE FASTENERS: NOTHING CAN BE GIVEN FOR DISCOUNT. The conference was followed with great attention by all the participants who felt directly involved and interested, also intervening with various questions of in-depth study. After the conference all the interventions have moved to the St. George Restaurant located within the Royal Park of Monza, where a convivial dinner was held that has amused the various Italian and foreign guests. The activity, although difficult and difficult to organize, we believe can be considered a great success, given the recognition received by several participants. We also believe it can be considered a milestone in the history of our association. Thanks to Massimo Grazia and Marco Tosin for their help in making the right choices. For all the associated friends, all the slides of the interventions can be found in the reserved area of ​​the site.